From 8 April 2013 the Department for Work and Pensions (DWP) introduced Direct Earnings Attachments as a method to recover money owed to DWP. A DEA has its own regulations and operates differently from other orders such as Deduction from Earnings Order (DEO), Attachment of Earnings Order (AEO) and Council Tax Attachment of Earnings Order (CTAEO). A DEA does not replace any of these other orders and in some circumstances employers may receive requests to implement deductions for multiple orders for the same employee. DWP are responsible for recovering monies as a result of debt arising under the Social Security Administration Act 1992. Where the Secretary of State has been unable to recover monies owed to the DWP from customers, those monies may be recovered by deduction from the customer's earnings. Where a DEA is to be implemented, the DWP will send an employer a formal notice to inform them of this. remit the amounts deducted (other than the administrative charge) by the 19th day of the month following the month in which the deduction is made. ensure payments to DWP carry the required reference - DWP Debt Management use the employee’s National Insurance number, which allow them to allocate to the customers’ accounts. 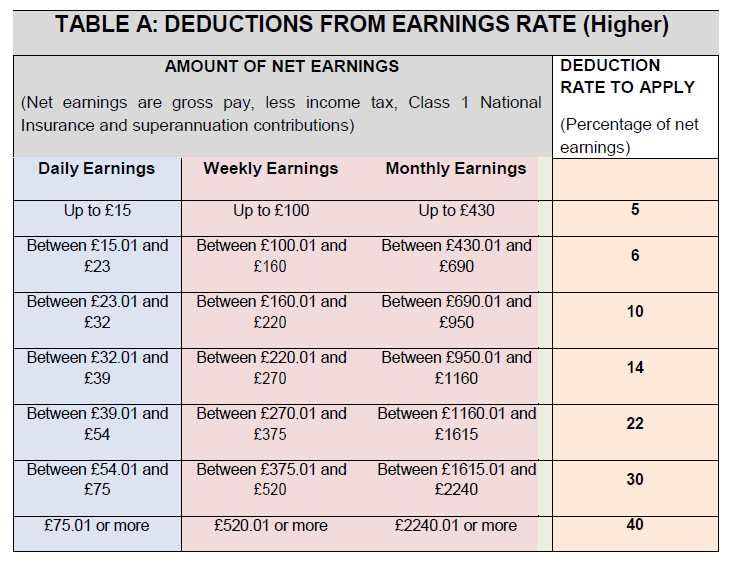 Where the DWP ask an employer to operate a DEA, the employer must consider what is known as the Protected Earnings amount which is an amount equal to 60% of an employee's net earnings. This means that for each pay period where a DEA calculation is applicable and after adding the amount of the DEA to the total amount of other orders that may be already in place, the employee must be left with at least 60% of their net wage. 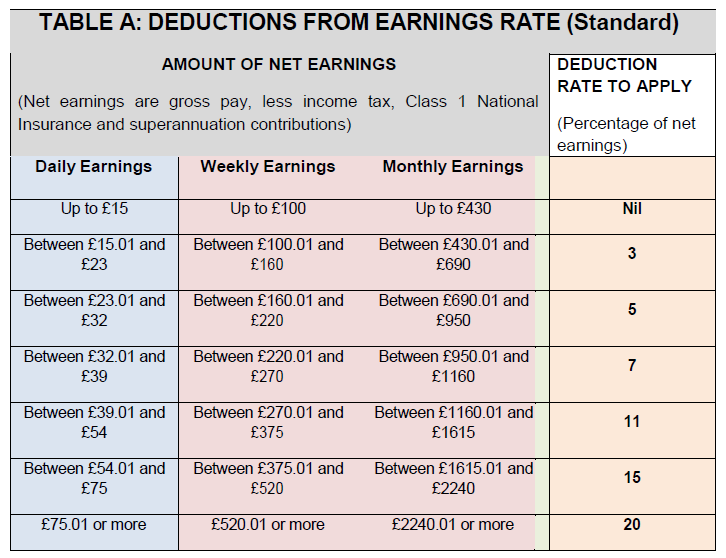 For each pay period where a calculation results in a DEA deduction, an employer may take up to £1.00 from their employee’s earnings towards their administrative costs. This can be taken even if it reduces the employee's income below the 60% protected earnings amount. How is a DEA calculated? There are two deduction percentage rates for calculation – Standard Rate and Higher Rate. The DWP will inform the employer which of these rates apply to an employee. The rate may change throughout the life of the DEA, from Standard to Higher and vice versa - in this instance, the employer will be notified of this by letter. 2) Fixed amount - tick this box if the DWP requests that a fixed amount is to be deducted from the employee and enter the periodic amount to be deducted, as stated on the Order.